Adventure, Romance, Mad Science! 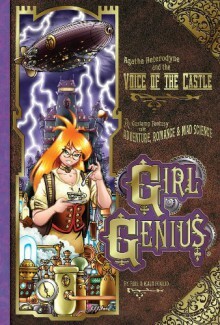 Agatha Heterodyne is the last heir to the Maddest of Mad Scientist families, and now she's returning home to claim the family castle. Unfortunately, it turns out that she's not the only one with that idea in mind. This collection represents an all-new installment of Phil & Kaja Foglio's award-winning gaslamp fantasy series and includes an extra four-page story in addition to the main plotline.